Impress your customers when your roll out this hand finished Raw Steel Salesman Rack. 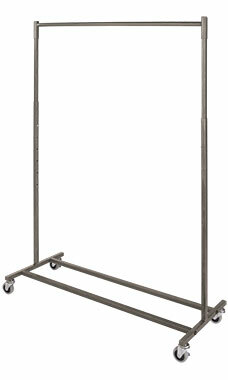 Our Raw Steel Salesman Rack makes displaying your merchandise easier than ever. This rack comes standard with casters to allow the rack to be easily moved around your sales floor. Our Raw Steel design features a stylish mottled brushed metal finish and welded corners. All of our Boutique Clothing Racks come standard with flat caps. Customize your rack by adding one of our four Finial designs. Finials easily attach and detach at the top of rack allowing flexibility.